Havana has the best hotels and accommodation in Cuba, although it is fair to say that the city also has many rather mediocre options, as with elsewhere. It doesn't really matter where you are based, as the city is fairly compact and taxis are cheap. 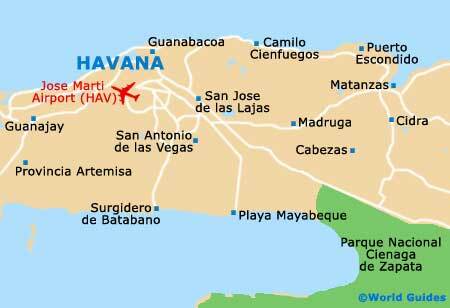 However, lodging is best had in Old Havana to be right in the thick of it, or the nearby areas of Central or Vedado. At the cheap end of the Havana accommodation spectrum are the so-called 'casas particulares' (private rooms), which can be hit and miss with facilities, although there are some 3,000 private houses to choose between. At the top end is the local chain known as Habaguanex. These are quality boutique hotels that are usually in refurbished buildings in choice spots. Most of the hotels in Havana are in the Old Town area (Old Havana/ Centro Habana), in the nearby Central, or farther north in Vedado. While Old Havana is well placed and has most of the attractions and allure, it can also be a bit noisy and dirty. Central Havana is quieter than Old Havana, as well as being a bit seedy, while Vedado is the best bet for families and the more discerning accommodation seekers, since it is the quietest and greenest area. Vedado is also good for the bigger hotels, and has a decent selection of budget casas particulares and similar lodging options. Farther out are the districts of Miramar and Playa, to the west of the city. These destinations are only around ten minutes out and close to the coast, and while away from the downtown area and majority of attractions, there is some good eating and nightlife out here. If you plan on staying in a casa particulare in Havana, be sure to research thoroughly, or at least check the place out first before committing to the accommodation. Many are second-rate and may not have hot water or boast iffy air conditioning. Down again are the pesos hotels - you pay with Cuban pesos only - although these are generally out of bounds to tourists.